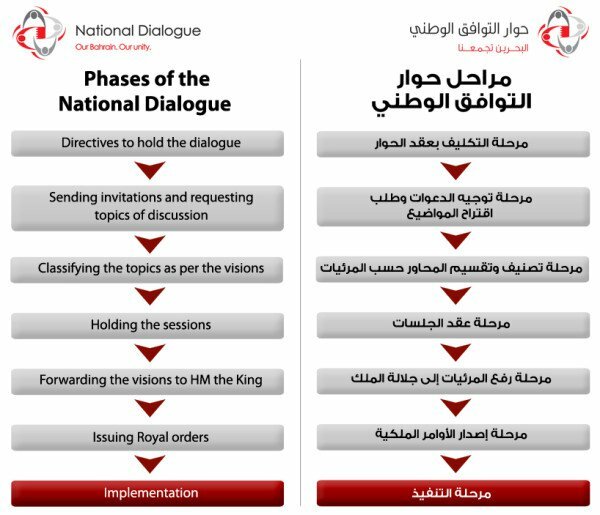 Interestingly, it seems that despite its start being some 10 days away, already 1/3 of the National Dialogue has already been completed! Step 1 of the dialogue is deciding to hold the dialogue. Done! Step 2 is sending invitations. Done! See how easy that was? 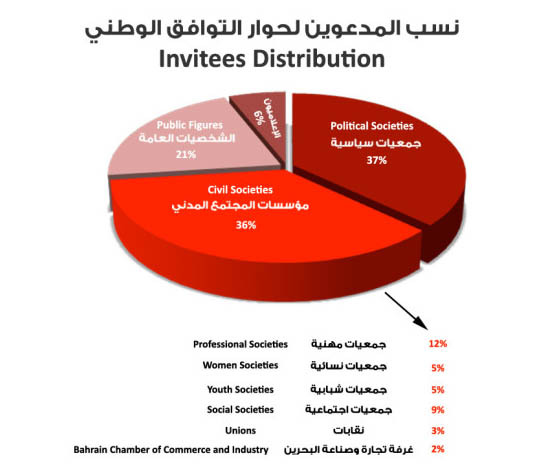 So, only 37% of those taking part in Bahrain's dialogue about political reform are actual political societies. Don't get me wrong: I support the United Barbers' Alliance as much as the next guy, and do want to see them get a fair shake in The New Bahrain™, but somehow this whole setup seems, well, contrived. As I said to a commenter to the previous article, the dialogue initiative was sparked by a specific set of events, namely a revolt by a largely-Shi'a (and secular Sunni) constituency with long-standing political demands. This constituency is not asking for a repeal of LMRA or for better schools but for specific revisions to the political status quo. The idea that the government will take the opportunity to embark on sweeping social, political, and economic change of the sort that requires participation from "professional societies" and the Bahrain Chamber of Commerce is hard to imagine. In the end, the government would like to frame the dialogue as a mere continuation of a decades-long modernization project that may or may not coincide with the largest mass uprising since the 1990s--something few seem to be buying. If a group of students--say, females--is upset with a professor because they claim he never calls on them in class, favors male students, and gives them undeservedly-low grades on their papers, does it make more sense for such a professor to amass all the students to decide on an entirely new curriculum, or to call in the female students privately to discuss their complaints? I appreciate that other (pro-government) political societies that have a stake in the outcome must necessarily be involved. But 250 delegates? Come on. And if one would still doubt the futility of this effort, King Hamad himself essentially indicated as much on Tuesday with a series of personal visits to influential families, for a bit of what one might call "pre-dialogue dialogue." That's right: how better to demonstrate the efficacy of a democratic process of political reform such as a 250-member-strong National Dialogue than by paying personal visits to a select group of one's political friends? Attended by his sons 'Abdallah and Nasr (I'm sure Salman was busy), King Hamad first visited the majalis of the Al Mahmud and Al Musallem of Al-Hidd, both longstanding--as in, for the past 200 years--tribal allies of the Al Khalifa. One of the Al Mahmud, Sh. 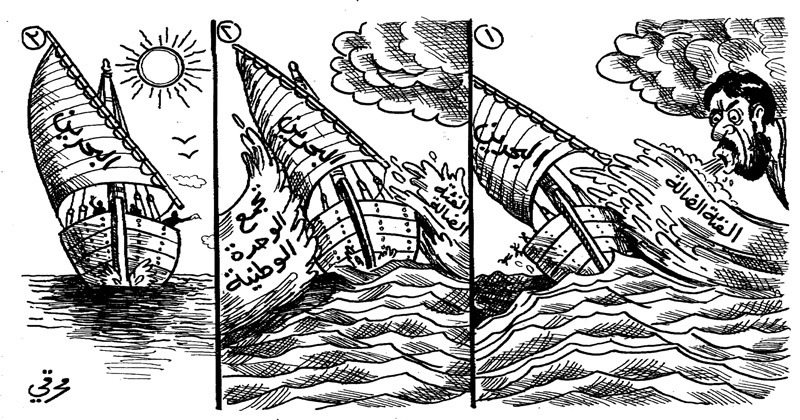 'Abd al-Latif, is today keeping that tradition alive as the firebrand leader of the National Unity Gathering, which, as the following cartoon from Akhbar al-Khaleej clearly shows, is the moderating force that propped up the ship of Bahrain through the current storm. Doesn't Bahrain look so happy and sunny now? Next, so as not to show any Sunni-Shi'i partiality, the three headed to the majlis of the late Ibrahim Muhammad Hasan Hamidan, former President of the Constitutional Court and recently-deceased scion of the Al Hamidan family, another Al Khalifa supporter. Finally, rumor had it a day earlier on Monday that three black Mercedes with royal plates were also spotted at the roundabout leading into al-Diraz, raising speculation of a high-level visit to some other prominent Shi'a family(s), perhaps even to Sh. 'Isa Qasim himself. Indeed, according to the Interweb, the latter was approached by a senior government delegation seeking a meeting but he refused it. Effectively, then, there appear to be at least two concurrent "dialogues": the monstrosity that is the 250-member National Dialogue; and then the more tribal-politics-as-usual sort of dialogue that involves secret meetings with political leaders and ceremonial visits to allied families' majalis. Can anyone guess which is more likely to produce actual results? If Hamad's first go at dialogue (2001-02) was any indication, my money is on the latter. This strange situation--wherein one must pay lip service to the National Dialogue in order to be part of the actual dialogue behind the scenes--has put the mainstream opposition in a difficult situation. On the one hand, al-Wifaq (and Wa'ad for that matter, as it has now been mysteriously unbanned) does not wish to appear to have been co-opted (its detractors would say) yet again; while it also does not want to be excluded from the parallel process of behind-the-scenes talks that will inevitably take place. On exactly this question the Bahrain Mirror (which has quickly replaced post-coup Al-Wasat as the independent Bahraini news source of choice) has a very interesting article, titled "Sh. 'Ali Salman: Sleeping With One Eye Open, and the Challenge of Accepting the [National] Dialogue." It discusses al-Wifaq's predicament as described above: balancing the consequences of accepting the dialogue (the perception--or perhaps reality--of government co-optation) with those of not accepting it (further harassment and isolation; a hit to its international image as the oppressed but reasonable opposition). Whatever the case, something tells me that al-Wifaq must eventually relent and take part in the July 1 initiative, if only to avoid a political sidelining of the sort that continues to plague the crown prince. Of course, given the ongoing harassment of its current and former members--the military trial of Mattar Mattar and Jawad Fayruz has just concluded, with a verdict due July 5--such a decision will not be easy. But it is difficult to see things ending better for the rest of al-Wifaq were its representatives not to show up on July 1. The less mainstream opposition, meanwhile, continues to try to fight the good fight. Another mass rally is planned for Wednesday tomorrow--dubbed the "Day of Solidarity with the National Icons [i.e., opposition leaders]"--as well as Friday. A banner asks, "With what will we respond to their resistance and struggle? Are we ready to resist and sacrifice?" The gameplan posted to opposition forums indicates that protesters will attempt to block roads with barricades. Good luck with that. The plan for Friday is still yet to be released. It will be interesting to see whether al-Wifaq will attempt to commandeer the event as it did in Sitra last week, presumably in an effort to make sure it did not get out of hand. 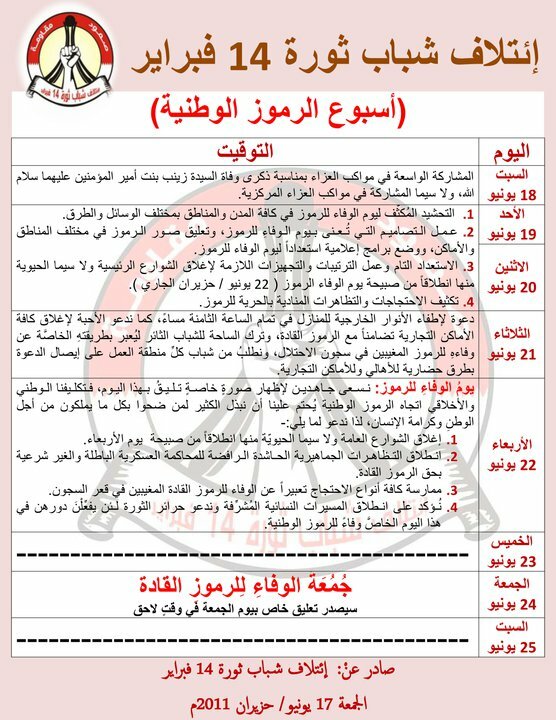 Unfortunately, come July 1, al-Wifaq's sway among the February 14 Revolution faction may well run out. Update: today's and Friday's rallies "in solidarity with the national icons" just got more interesting, since, as reported everywhere, most of these "national icons" have just been sentenced to life in prison. Of the top opposition leaders, only Ebrahim Sharif escaped relatively unscathed with a five-year sentence. Still, one has to imagine that Wa'ad is now out of the National Dialogue, unless of course Obaidly al-Obaidly is appointed by the government to be its new Secretary General. As for al-Wifaq, it's too early to say how or whether this will affect its participation. While it certainly won't welcome the sentences, at this point it is probably more interested in the fate of its own former MPs, due to be sentenced July 5. I'm sure the timing of the verdict--four days after the start of the dialogue--is coincidental. In any event, there is scheduled a press conference for tomorrow where 'Ali Salman is expected to announce the group's decision. Finally, some have mentioned already the possibility of a royal pardon, which in previous years has been par for the course in political cases such as these. The difference now, though, is that the one who does the pardoning is not necessarily any longer in charge (for the latest evidence of this, see the Bahrain Mirror article cited above). And a sure way for the king's faction to lose even more allies inside the Al Khalifa is to extend yet more pardons to "terrorists." Update 2: this interesting thread on the main opposition forum gives an eye-witness report of the post-verdict reactions/responses of several of those sentenced, including Sh. 'Abd al-Wahhab, 'Abd al-Hadi al-Khawajah, and Hasan al-Mushaimi'. 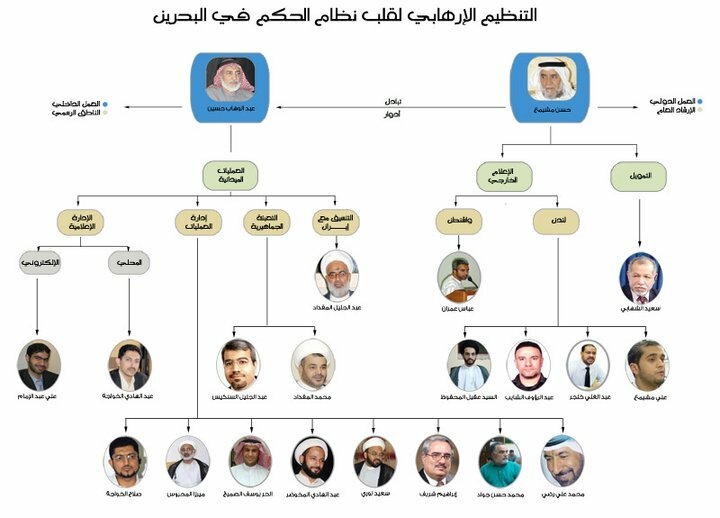 Update 3: it seems the Bahraini government media team is hard at work once again, this time in producing an updated terrorist organization flowchart depicting the supposed relations between the opposition leaders just sentenced. Presumably, this supersedes the less elegant version that appeared some time ago in Al-Watan. Excellent if not depressing summary. We all know of course that the dialogue will fail. The opposition will either lower their demands and hence fail to control the street, or they will leave without achieving any of their demands. The question is, whats next? From your analysis and the Bahrain mirror article, it seems that the King is no longer in control of Bahrain. So if the dialogue fails, and it will, what is next for Bahrain? Another 10 years or so of repression with sporadic protests here and there? 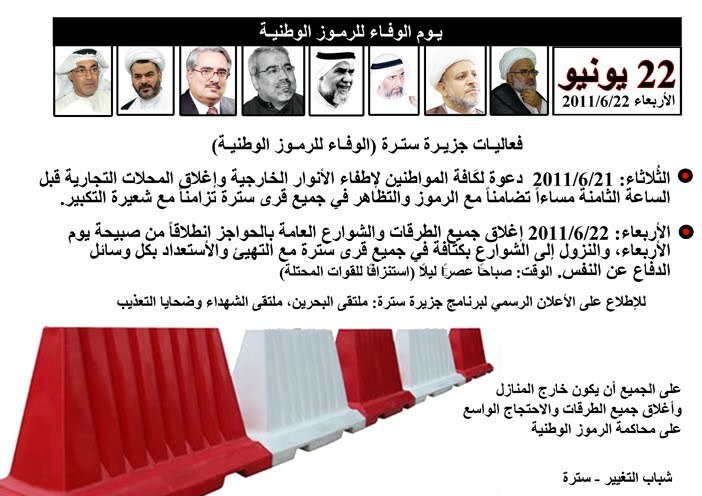 I think it would be folly for Wefaq to join the "dialogue" as is. The King (if he's still in control) will have to engage with Wefaq behind the scenes even if they don't agree to this dialogue. The Royals simply do not have a choice of not engaging with Wefaq if they want to "sell" or "market" their solutions internally and internationally. you might already have seen updates that the invitations have now increased to 300. I also thought, that Alwefaq by refusing to announce its decision today, that mean it's more likely to join dialog (a decision that can't be announced today after hearing the verdicts, and while some ppl ready to burn things). That's neither my place nor the purpose here. Yes CNN was wrong. 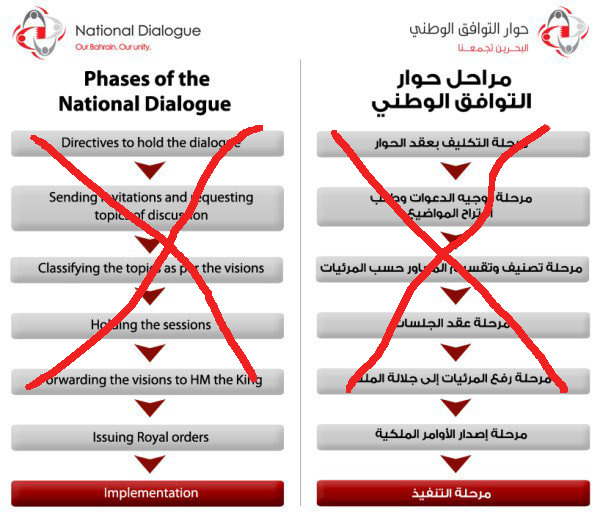 What Alwefaq said they will NOT do is to submit their views (or what they want from dialog) - step 2 on the above diagram- which was due for submition on Thursday. so, the govt said it will extend deadline to Sunday! Thanks for the link. I had assumed the extension was to give more time for al-Wifaq to agree to participate. We'll see if it works.